1960 Heiland Pentax H-2 Camera Ad - One Day From Life! Vintage Paper Ads > Cameras - Photography > Pentax > 1960 Heiland Pentax H-2 Camera Ad - One Day From Life! This is a 1960 ad for a Heiland Pentax H-2 camera! The size of the ad is approximately 8.5x11 inches. 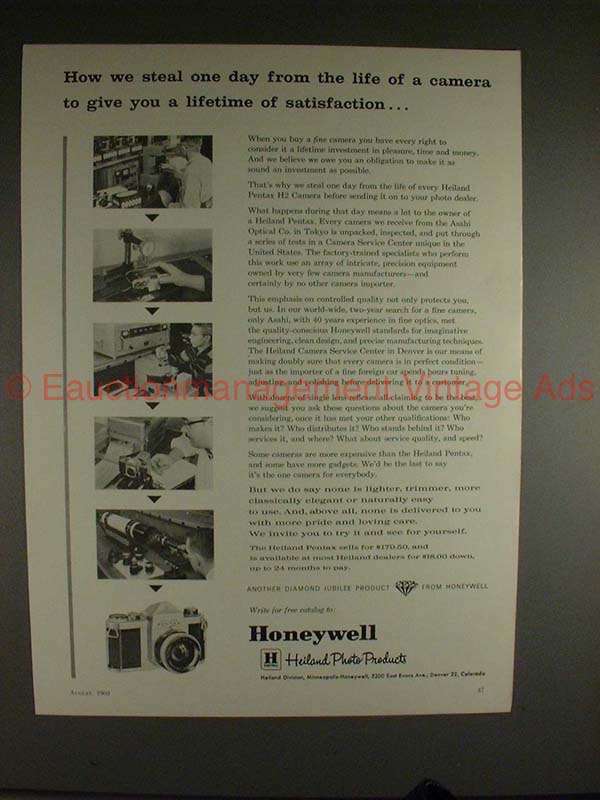 The caption for this ad is "How we steal one day from the life of a camera to give you a lifetime of satisfaction...!" The ad is in great condition! This vintage ad would look great framed and displayed! Add it to your collection today! 1960 Heiland Pentax H-2 Camera Ad - You Seen it Yet? !